Posted by dutchgrub	on Friday, July 31, 2009 at 21:21. 0 Comments. Today is the first day of De Parade Amsterdam, a theater festival with focus on food and drinks in Amsterdam’s Martin Luther Kingpark. De Parade is different from other festivals. The shows are short and creative and held in small tents. The vibe has some circus, a little fairy tale, street music and story telling. Everything is set up around a central food court where people meet, eat and drink, and decide which shows they want to see. The artists will tour the food court and entertain the visitors with small stunts trying to lure them to their show. The good shows do sell out quickly, so some advance planning and reservation of tickets is advisable. I love Dutch poppy bard Spinvis who is a regular at the yearly event and this year has dreamt up a concept called kamermuziek (Dutch) – or chamber music. The show is some sort of behind the scenes look at how he makes music, all by himself, using a variety of sounds and instruments. Another classic and yearly crowd favorite at De Parade is the Silent Disco – a large crowd grooving to the beats with headphones. The effect is pretty cool when you see loads of people getting down in sync without a single noticeable sound. While not a food festival, De Parade does a good job at wining and dining the guests, some of which actually enjoy the food and drinks so much that they never make it to any of the shows. The main food attraction is Restaurant de Aalmoes – Dutch for the alms. 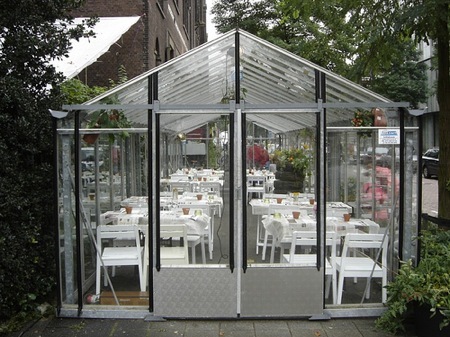 It’s a portable greenhouse in which two reputed chefs serve a biological French menu. The other restaurants and bars are a cosmopolitan mix of Dutch pancakes, Mexican burritos, Italian wood oven pizza, Sushi and much more.